A customer returns an item she bought from you. You refund the purchase price to her. The returned item is either put back into your inventory or is counted as inventory shrinkage. When a customer returns an item, you'll handle it using Point of Sale—whether the original order was placed online or in-store. Go to Point of Sale. In the item search field, click Return Items. Scan the returned item or use item search to find it. If you use item search, make sure you select the correct SKU for the returned item! Bookstore will look for the original order. If it discovers more than one possible order, it will prompt you to find order. In the Find order dialog, click the order number to view it. When you've found the correct order, click the checkbox next to it. The information in the order may fill in other fields on the screen (e.g. customer, address, etc.). 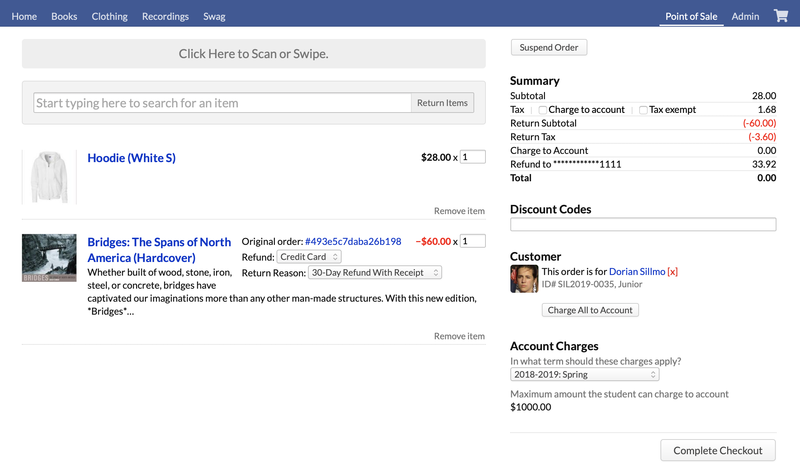 Depending on the payment used for the original order, you may get different options in the Refund drop-down. Your choice will be reflected in the information under Summary in the right column. Account: Adds a pending credit in the term you specify when you complete checkout. Credit card: Refunds the money to the credit card used to place the original order. If necessary, change the quantity. If the customer wishes to buy something, click Done Returning Items. You can then add other items to this order for purchase. The refund amount will be deducted from the order total under Summary. The item has been returned, a new order has been generated, and the customer has been refunded. Now you need to decide what to do with the returned item. Enter them back into your inventory so they can be sold again. Count them as inventory shrinkage, which affects your Bookstore inventory cost flow. You can do both of these things in the Admin > Returned Items report. Go to Admin > Returned Items. You'll see each individual returned item in a list, together with the most pertinent information: order number, return reason, and quantity returned. Click the order number to see whether there are any return details that will help you decide about returning the item to inventory. To return an item into your inventory (which lets you sell it again), enter how many you'd like to re-enter and click Apply. If you do not wish to take the item back into inventory, enter 0 and click Apply. This will count as inventory shrinkage. As you process each item, it disappears from the list. Items not returned to inventory are counted as inventory shrinkage. A ledger entry will be created in your inventory shrinkage account and will be calculated according to your inventory cost flow method. Items returned to inventory are available for sale again. 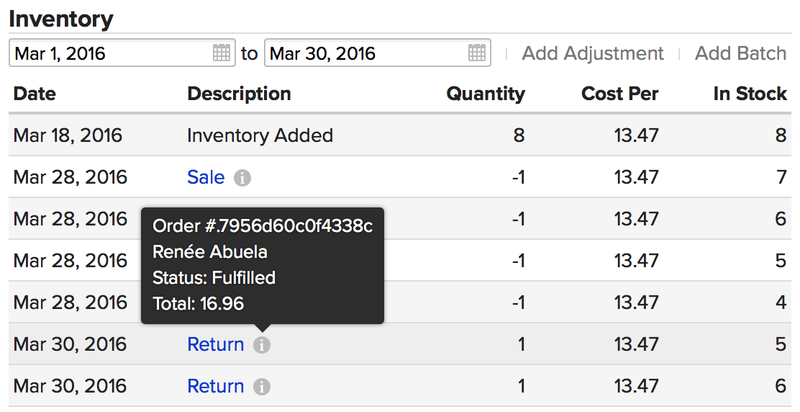 You'll see an entry under Inventory on the item segment's page that indicates the return.